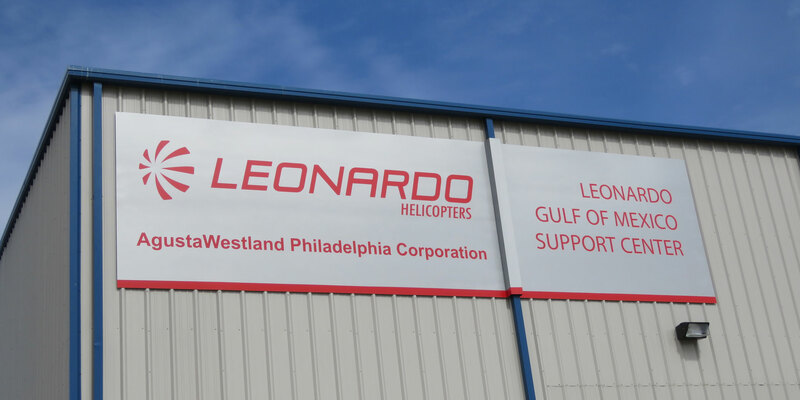 Leonardo Helicopters opened a new customer support facility yesterday in Broussard, Louisiana. Leonardo Helicopters opened a new customer support facility yesterday in Broussard, Louisiana, bringing the number of such centers in the Americas to four. The 21,000-sq-ft repair and warehouse facility is situated on a two-acre site and will initially employ 15, provide 24/7 customer support, stock a wide variety of helicopter parts, and provide a far-ranging menu of repair services, including blade repair and mobile blade repair. It also includes space for sales, tech reps, and engineering support. Three tech reps will be based there. The Gulf Coast Support Center is strategically positioned to support the approximately 90 AW139 intermediate twins, 40 AW119 singles, and numerous AW109 light twins operating in the region, according to Michael Hotze, Leonardo’s vice president of customer support and training for AgustaWestland Philadelphia Corp. Regional customers include major offshore energy helicopter service companies Arrow Aviation, Bristow Group, ERA, and PHI. Troy Penny, who will be the general manager at Broussard, said the facility will be able to overhaul a set of rotor blades in 21 days and throughput up to 1,500 blades per year. “What we’re really building is capability that doesn’t exist in the U.S. right now. That is our short-term goal. We are opening with all the repair capabilities that currently exist in the U.S., and then we will expand into the repairs that [currently] have to go back to Italy,” Penny said. He noted that component repairs involving bushings, re-machinings, tip caps, and sweep corrections, for example, are burdensome to customers and can have turn times as long as 18 months. Penny said Broussard would provide area customers with pick-up and delivery service using a dedicated truck and, when possible, provide same-day service. Hotze said the new service center is part of Leonardo’s larger “Team Up” initiative to get closer to its customers, understand their needs, and make them successful. Team Up provides customers with services that include parts forecasting which Hotze said is up to 90 percent accurate. The Broussard facility also will be able to access customer health and usage monitoring system (HUMS) data for customers who are subscribed to Leonardo’s Heliwise service. Heliwise is supported by two engineers in Philadelphia, three in Italy, and two in Malaysia who look at customer HUMS data full-time.